They Want to Be On City Council. Do They Want to Solve Your Problems? 2014 is the first year that Austin voters will pick one City Council member from a local district, instead of six members for the whole city. AustinDistrict7.org brings voters in North Austin’s new District 7 the information to make an informed choice. Is run by District 7 residents unaffiliated with any candidate (About). 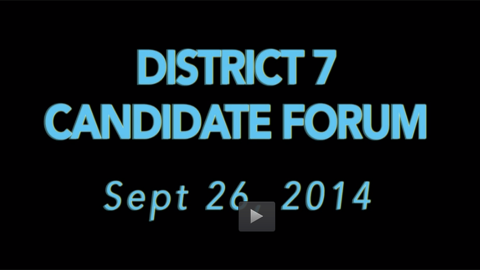 Provides detailed information on District 7 Candidates. The editorial board on October 3 announced it would not endorse a candidate. Each candidate can provide one endorsement op-ed from their supporters. Explores the different Communities within the district. Describes the Issues each community faces. Shares campaign news, and welcomes courteous editorials and essays from voters, experts, and candidates. (News & Opinion). 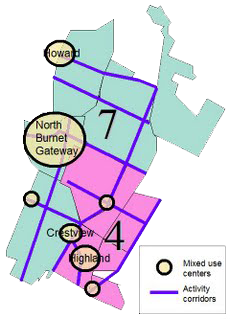 North Austin’s two Council district boundaries make more sense if taken together. The districts share a common suburban commercial street network – the framework for planned ‘walkable’ infill growth and transportation. North Austin suffers from poor east-west road infrastructure, an issue that recent transportation planning has ignored. Areas northeast suffer from poverty and crime. Areas to the south are being redeveloped in ways that drive out families with children. Getting the details of infill housing, transportation and public space right – while preserving balanced age and income demographics, will be the defining challenge of the next 30 years. ©2014-2019 Austin District 7 • All Rights Reserved.